Cardiovascular implantable electronic devices, chiefly implantable cardiac pacemakers and implantable cardioverter–defibrillators, are used to treat a variety of electrical cardiac defects, including bradyarrhythmia, ventricular tachycardia and fibrillation; they are also used in patients with complete heart block.7,8 It is estimated that 3 million people globally, including more than 500?000 individuals in North America, have implantable cardiac pacemakers.8 The use of such devices has significantly reduced mortality rates among patients with a history of life-threatening ventricular arrhythmia,7 and they are becoming more commonplace in the general population. 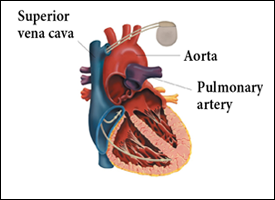 Figure 1: Implanted cardiac pacemaker. 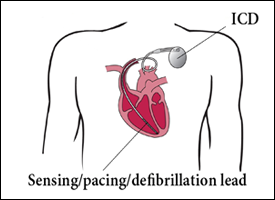 Figure 2: Implanted cardioverter–defibrillator (ICD). The inconsistency of the supporting evidence makes it difficult to offer authoritative guidelines on the use of ultrasonic dental devices for patients with cardiovascular implantable electronic devices. We suggest a practical, conservative approach to using such equipment in this patient population. 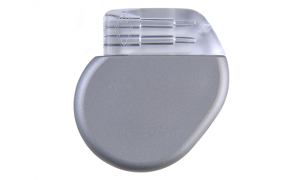 All patients who have an implantable cardiac pacemaker or cardioverter–defibrillator should be encouraged to carry the manufacturer's identification card with them at all times. Oral health care providers should document the following in the patient's record: manufacturer of the device, model number, serial number, date of implantation and mode of operation.14 Caution should be exercised when operating ultrasonic equipment and battery-operated curing lights near dental patients or health care workers who have cardiovascular implantable electronic devices.8 Based on the current evidence, it is recommended that use of magnetostrictive ultrasonic equipment be avoided on or near individuals with implantable cardiac pacemakers or cardioverter–defibrillators.6 At this time, piezoelectric equipment appears to have no substantial effects on these devices.1,6 Further in vivo clinical trials are warranted to determine the precise effect of ultrasonic dental equipment on cardiovascular implantable electronic devices. Dr. Stoopler is an associate professor and director of the postdoctoral oral medicine program, department of oral medicine, University of Pennsylvania School of Dental Medicine, Philadelphia, Pennsylvania. Dr. Sia is a resident in the department of oral medicine, University of Pennsylvania School of Dental Medicine, Philadelphia, Pennsylvania. Dr. Kuperstein is an assistant professor and director of the oral diagnosis, emergency and radiology clinics, University of Pennsylvania School of Dental Medicine, Philadelphia, Pennsylvania. Acknowledgements: Permission to reproduce Figures 1 and 2 granted by St. Jude Medical, Inc.
Trenter SC, Walmsley AD. Ultrasonic dental scaler: associated hazards. J Clin Periodontol. 2003;30(2):95-101. Watmough DJ. Role of ultrasonic cleaning in control of cross-infection in dentistry. Ultrasonics. 1994;32(4):315-7. Yilmaz Y, Guler C. Evaluation of different sterilization and disinfection methods on commercially made preformed crowns. J Indian Soc Pedod Prev Dent. 2008;26(4):162-7. Wilson BL, Broberg C, Baumgartner JC, Harris C, Kron J. Safety of electronic apex locators and pulp testers in patients with implanted cardiac pacemakers or cardioverter/defibrillators. J Endod. 2006;32(9):847-52. Epub 2006 Jun 23. Plotino G, Pameijer CH, Grande NM, Somma F. Ultrasonics in endodontics: a review of the literature. J Endod. 2007;33(2):81-95. Antunovic DM. Electrical interference of pacemaker activity by electrical dental devices: a short review. J N Z Soc Periodontol. 2007;(90):7-11. Brand HS, Entjes ML, Nieuw Amerongen AV, van der Hoeff EV, Schrama TA. Interference of electrical dental equipment with implantable cardioverter-defibrillators. Br Dent J. 2007;203(10):577-9. Roedig JJ, Shah J, Elayi CS, Miller CS. Interference of cardiac pacemaker and implantable cardioverter-defibrillator activity during electronic dental device use. J Am Dent Assoc. 2010;141(5):521-6. Miller CS, Leonelli FM, Latham E. Selective interference with pacemaker activity by electrical dental devices. Oral Surg Oral Med Oral Pathol Oral Radiol Endod. 1998;85(1):33-6. Drisko CL, Cochran DL, Blieden T, Bouwsma OJ, Cohen RE, Damoulis P, et al. Position paper: sonic and ultrasonic scalers in periodontics. Research, Science and Therapy Committee of the American Academy of Periodontology. J Periodontol. 2000;71(11):1792-801. Position paper update. J Periodontol. 2007;78(8):1476. Carlson BK. Pacemakers and dental devices. J Am Dent Assoc. 2010;141(9):1052,3; author reply 1053-4. Crossley GH, Poole JE. More about pacemakers. J Am Dent Assoc. 2010;141(9):1053; author reply 1053-4. Yeo, TP, Berg NC. Counseling patients with implanted cardiac devices. Nurse Pract. 2004; 29(12): 58, 61-65.